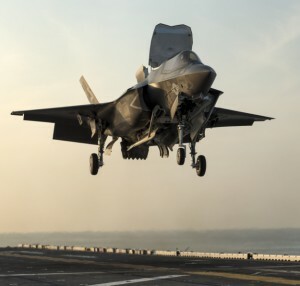 The U.S. Marine Corps’ F-35B short take-off vertical landing (STOVL) version of the Joint Strike Fighter (JSF) is making good progress toward meeting its July 2015 initial operational capability (IOC) date according to company officials. The Marine Corps intends to declare the F-35B operational with interim Block 2B capabilities in July 2015. The Block 2B configuration includes basic data-fusion capabilities including data-links and a limited suite of weapons including the Raytheon AIM-120 advanced medium range air-to-air missiles (AMRAAM), 500lbs GBU-12 laser-guided bombs, and 1000lbs GBU-32 Joint Direct Attack Munitions. One sign of progress Van Camp pointed to was that an F-35B test aircraft successfully engaged two target drones simultaneously with two AIM-120s over the Point Mugu test range in California on May 27. In addition to weapons capability, the Block 2B configuration will also afford operational pilots the ability to use more of the F-35B’s flight envelope. Currently, F-35B training aircraft operating with the Block 2A software are restricted to 450 knots calibrated airspeed (KCAS), Mach 0.9, 18 degrees angle of attack and 4.5Gs. However, with the delivery of Block 2B, the aircraft will be cleared to operate at 550 knot KCAS, Mach 1.2, 50 degrees angle of attack and 5.5G, Van Camp said. However, the F-35B will not be cleared to its full 630 knots KCAS, Mach 1.6, and 7Gs envelope until Block 3F is delivered. Further, with Block 2B, the aircraft’s maximum ceiling will be limited to 40,000ft rather than the full 50,000ft ceiling required for the full Block 3F operational capability. After the Block 2B testing is complete, U.S. government analysts will have to pour over the test data to release the software to the operational fleet. “That fleet release will be in the spring,” Van Camp said. He added that the software looks to be on track to meet the Marines’ IOC date. But software is not the biggest potential pitfall facing the Marines in their quest to declare the F-35B operational. Both JSF program manager Lt. Gen. Chris Bogdan and Marine Corps’ deputy commandant for aviation Lt. Gen. Robert Schmidle testified before Congress in March that modifying the existing F-35B fleet to operational standards in time for IOC would be the greater challenge. Those hardware upgrades are collectively called “Group 1 modifications”, Van Camp said. There are about 57 individual modifications included in that package. “Those inductions and work continues to improve on a daily basis,” he said. However Group 1 modifications do not include a more comprehensive structural upgrade needed to rectify an airframe durability problem that has cropped up in recent months. While the Marines continue their march towards operational capability with the F-35B, which means a minimum of 10 deployable aircraft along with trained pilots and maintenance crews, there are still unanswered questions about operationally testing the JSF prior to that IOC date. “The government is going through discussions right now about what kind of operational tests will occur with the release of Block 2B,” Van Camp said. 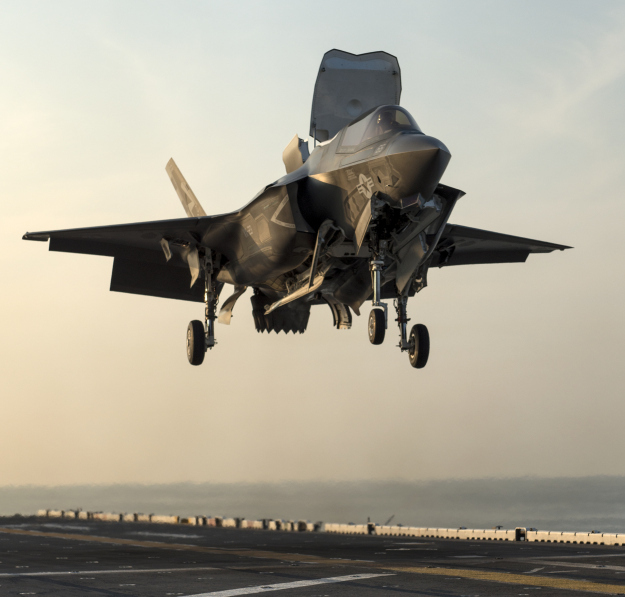 The Marine Corps, which is the final authority on declaring the F-35B operational or not, referred questions about operational testing to the F-35 Joint Program Office (JPO). JPO officials did not respond to attempts to contact them. But even as the F-35 integrated test team continues work on Block 2B, work is continuing on the follow-on Block 3i and Block 3F software packages. Test flights recently started on the U.S. Air Force’s F-35A variant with Block 3i—which is a rehosted version of Block 2B operating on new processors called Technology Refresh-2 (TR-2), Van Camp said. The Air Force expects to declare the F-35A operational with the Block 3i software in August 2016. Eventually, all of the existing F-35 aircraft that have been delivered with the older computer hardware will be retrofitted with the new processors. The U.S. Navy, however, is the lone holdout and will not declare the F-35C operational until August 2018.